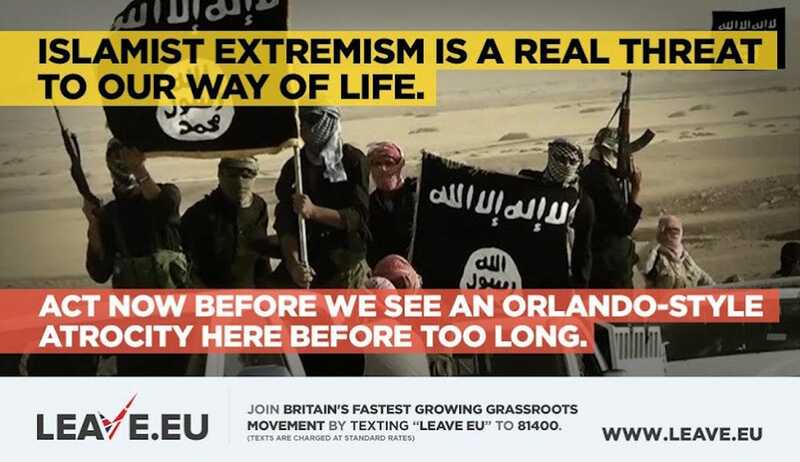 A group that is campaigning for Britain to leave the EU ignited fury today after publishing a poster on Twitter suggesting that an ‘Orlando-style atrocity’ could happen in Britain if a Brexit doesn’t take place. Leave.EU — founded by UKIP-donor Arron Banks — deleted the tweet after hundreds of Twitter users including members of parliament and high-profile journalists condemned it in the strongest terms.
.@LeaveEUOfficial This is really shameful. 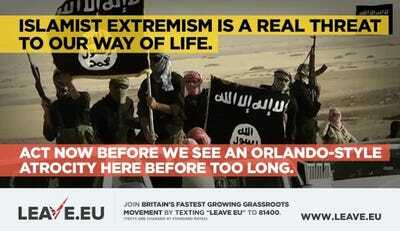 The poster appeared to imply that remaining in the EU would make it easier for terrorists to enter the UK and to transport weapons into the country. However, as a number of Twitter users rightly pointed out, the perpetrator behind the weekend’s attacks in Florida was born in the US and bought the weapons that he used in the attacks in the States. Leave.EU is one of a number of groups that has been set up to campaign for Britain to leave the 28-nation bloc on June 23. It describes itself as “Britain’s fastest growing grassroots movement to leave the EU” on its website. Business Insider has contacted the group for comment.